Welcome to 2012 everyone! I hope one and all had a good holiday. My thoughts and prayers continue to go out to those who are going through challenges and sad times. I know there are a few. I have all the details of the move and the re-building on my weaving blog Renee Weaves! My painting studio has been moved to another room in our house along with the loom and it is set up and ready to go for tomorrow morning. 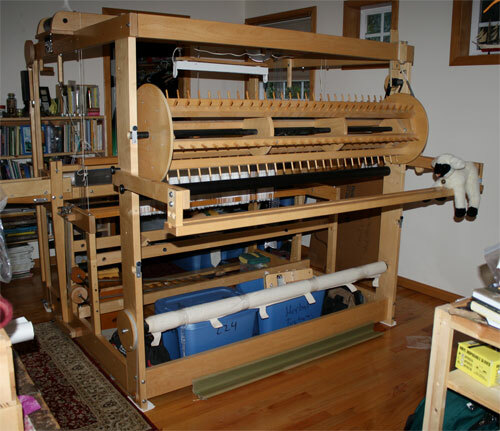 The loom still has a few things to finish and I still have to get things put away in the studio but it will be up and weaving soon. All things weaving will be posted on my weaving blog and the art will continue on this blog. I had always intended to get back to weaving. I intend to sell my handwoven items in addition to my daily paintings. My thoughts are that the weaving will take a bit of the pressure off the art making and allow me a bit of growing room for my art skills. We shall see how it all works out! So this is my life for 2012; art, weaving, music, with good homemade whole foods meals, beach walks and a few good books to read. Life is good. Here is to a year of growth. I believe we are all in for some rather interesting times in the coming years. Hang on to your loved ones, brushes, pencils, and shuttles and lets all look after one another. P.S. This is my 100th blog post for this blog!